It is not often that you come across a recording that is so ineffably brilliant that attempts to describe it, you feel, might only diminish its beauty. The fact that it is a debut recording is even more astounding. 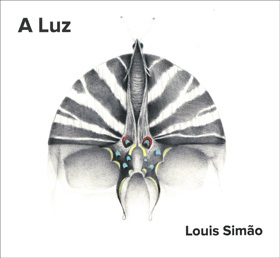 But A Luz from Louis Simão is one such recording. 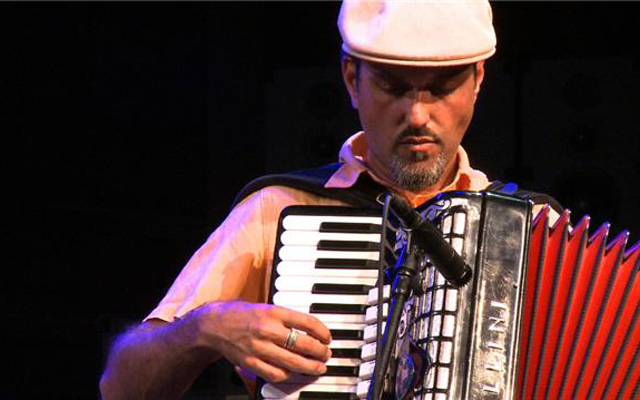 Simão is one of the most sought after musicians in Toronto, usually for his playing on the accordion. However, his extraordinary versatility at that instrument is just one dimension of his musicianship. Simão is a really fine bassist, guitarist, pianist and percussionist as well. And now we know from this release that his compositional skills are quite beyond reproach too. Moreover he is smart – even wise beyond his years. The music industry in Toronto, like elsewhere in the world, has opened the way for the work of many talented musicians to see the light of day, where it might never have been heard not too long ago. However, this resulted in a lot of music being released before the art from when it came has really fructified. This is obviously not the case with Louis Simão. He was smart to hold back for a long time. The results of his patience are all over this disc. Clearly in the intervening years Simão has honed his craft. His polished, sophisticated instrumentalism is in evidence at every turn. Each time he plays the accordion, guitar, bass, or whatever else plays, one is struck not only by mastery over it, but also the elegance with which it sings. The guitar and accordion resound with rich textures; the bass with glorious tone and the Rhodes is richly atmospheric. And, of course, Louis Simão is a marvelous vocalist whose heart-stopping laments and poetic rejoicing elevate these songs to a rarefied realm. The songs themselves come from a very deep place. The musical rhythm is quintessentially Brasilian. Simão is Portuguese, which only enriches the well from where the poetry springs and he gives an exceptional performance of each song in which his dynamic control, from the whispered opening to the blaze of glory at the close is breathtaking. Listen to ‘Um Cantador’ and you’ll hear exactly how this sounds. That song, as well as ‘A Nossa Paz’, both of which also feature the pristine beauty of Patricia Cano’s voice, has lyrics by the extraordinary Brasilian writer, Wagner Petrilli. ‘A Luz (Da Partida)’ and its counterpart ‘A Luz’ (which closes the album) represent the epitomé of songwriting perfection: silvery in tone, elementally melancholic and joyous as well as they describe – one instrumentally and the other with lyrics – death and birth; the extinguishing of a candle and the lighting of a new one. Emotional depth apart, Louis Simão has mastered form like few musicians have. The beauty of ‘Confluência’ is heightened by the suggestion of the Brasilian partido alto. ‘Retratos, Cartas e Cinzas’ is a glorious choro in the grandest tradition of the great carioca, Guinga. ‘Passaritos Fritos’ is one of several tunes that pay homage to the frevo and the samba rhythms are all over ‘Um Cantador’ and elsewhere. The folk-inflected ‘Três Anos’, an elegiac lament, is prototypically Portuguese and the sobbing saxophone solo by David French is quite memorable. Musical beauty also abounds thanks to the presence of Bill McBirnie, one of the finest flutists anywhere today; the incomparable musicianship of Luis Orbegoso, Michael Occhipinti, Rich Brown, Marcus Ali, Peter Lutek, and the rest of the all-star band make this an album to cherish. Track List: Um Cantador; A Luz (Da Partida); Confluência; Retratos, Cartas e Cinzas; Lundu da Figueira; Passaritos Fritos; O Medronheiro; Flor Amargurada; Três Anos; A Nossa Paz; A Luz. Personnel: Louis Simão: vocals, acoustic & electric guitar, electric & acoustic bass, accordion, Fender Rhodes, percussion (3, 5); Luis Orbegoso: percussion (1, 3, 4, 5, 6, 8, 10), backing vocals (1, 3, 8, 10), marimbula (5); Roger Travassos: drums (8, 9), percussion (1, 10); Bill McBirnie: flutes; David French: tenor & soprano saxophones; Maninho Costa: percussion (1, 3, 5, 6, 10); Marito Marques: drums (3); with Guests: Patricia Cano: vocals (1, 10); Jessica Lloyd: vocals (3, 8); Carlos Bernardo: acoustic & electric guitar (2), bouzouki (6); Rich Brown: electric bass (11); Wagner Petrilli: acoustic guitar (11); Michael Occhipinti: electric guitar (1, 3, 10); Aleksander Gajic: violin (3, 6, 8, 9); Konstantin Popovic: violin (3, 8, 9); Moira Burke: viola (3, 8, 9); Mateusz Swoboda: cello (3, 8, 9); Jordan O’Connor: acoustic bass (3, 8, 9); Peter Lutek: E flat contra-alto clarinet (4, 8, 9), C clarinet (4); Marcus Ali: clarinet (4, 9).